When I was in middle school, I had a lot of trouble fitting in with my classmates. In hindsight I realize that many middle schoolers feel this way, but at the time I felt like I was the only one. It seemed like everyone else had meaningful friend groups and wore the right clothes and paid attention to gossip, and I was the weirdo who wrote stories in her notebook during class or read Babysitters Club books under her desk and raised her hand whenever the teacher asked a question. 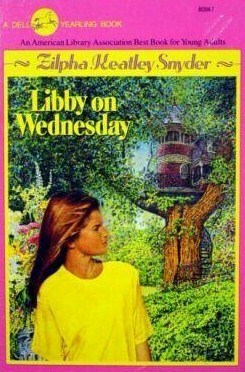 But when I read Zilpha Keatly Snyder’s Libby on Wednesday, I didn’t feel like such a weirdo after all. Libby was like me: she was eleven years old and precocious, smart at school but didn’t understand social rules, and she was a writer, too. Six or seven years ago, I was at ALA, and my friend Emily and I saw that Zilpha Keatly Snyder would be signing at the Simon & Schuster booth. We ducked out from the Penguin booth, where we were working, and quickly ran over to meet her. I told her my name and I said, “Without your book Libby on Wednesday, I would not have survived middle school.” Then I started to cry. I just stood there and sobbed. Emily had to take me away. I was really embarrassed at the time. Today I read that Zilpha Keatly Snyder has passed away at the age of 87. I’m glad that I told her what her writing meant to me when I had the chance. That’s a memory that I think I’ll keep with me always.